Although there are lots of new buildings and a lot of construction going on all over Haiti, those living in the slums benefit none of it. Although many received subsidies so they could move out of tents in Port-au-Prince parks and public areas, the money quickly ran out and their situations haven’t improved. Nation rebuilding has begun, Prime Minister Laurent Lamothe says, but more money is needed for progress to continue. PORT-AU-PRINCE, HAITI—This city is a totally different place that it was four years ago today, when one of the world’s worst natural disasters hit it: a 7.0-magnitudeearthquake that shattered thousands of buildings and killed up to 300,000 people. In fact, some afternoons looking out the car window as I drive around, I can forget it happened at all. There is little sign of rubble that piled up — 97 per cent is gone, according to United Nations statistics. Most of the broken and flattened buildings that lined the main arterial roads have disappeared. And the thousands of putrid tents and patchwork shanties that slumped in the city’s big parks and main squares have been swept up and packed away. In their place: grass, flowers, a new stadium, a basketball court. Yesterday, I watched kids ride their bikes around Champs de Mars, the city’s version of Nathan Phillips Square that two summers ago was home to 30,000 families. It is being rebuilt in phases. There are new buildings all over town: a new airport, new upscale hotels, new private university buildings, new pharmacies and brightly painted butiks — small, concrete corner stores. Then there are the construction sites, clad in red siding inscribed with the government’s current motto, “Haiti Ap Vanse.” Haiti is advancing. The city has left the emergency room, it seems. It’s started rehabilitation. The statistics, offered by the UN’s Humanitarian Action Plan for Haiti 2014, support this: Over the past four years, the number of people living in camps has dropped from a high of 1.5 million to 145,000; cholera cases have more than halved; severe food insecurity has declined. Haitian Prime Minister Laurent Lamothe added more achievements in his anniversary report to media: kidnappings are down by 55 per cent; public investments are up by 8 per cent; and there are 190 community rebuilding projects throughout the country. “The reconstruction is real,” he said. But, leave the main streets and nose your way into one of the city’s many packedbidonvilles (shantytowns), like Fort National, and the country’s deeper illness confronts you abruptly: extreme poverty. Fort National is a slum that cascades down a hill overlooking the field where the national palace once stood. According to a USAID report, more than 80 per cent of the small, concrete houses here were destroyed in the earthquake. What’s replaced them, largely, are tin-and-concrete sheds that rent for $340 (U.S.) a year — mostly to people who moved back from the Champs de Mars. The thin alleys between them are clogged with urine-soaked garbage. I stopped in on Neslene Rene, a 24-year-old woman who was five months pregnant when we last met two summers ago. She, too, had just moved back into the neighbourhood after two and a half years in the Champ de Mars. Together with her mother and little sister, she had swapped the tin shed in the camp for a one-room wood fort in the ghetto, made from dozens of stubby wooden boards crudely banged together. The rent was only $125, much less than the $500 subsidy they’d received for the move by the Canadian government. The difference was to be seed money for her mom’s business plan — selling eggs and bread on the street. That way, they could soon move to a bigger place. While we spoke, two wallboards fell from the side of Rene’s home and she quickly scooped them up and pushed them back into place. Haiti is not “ap vance” up here, and here is where the majority of Haitians in Port-au-Prince live — the poor neighbourhoods. 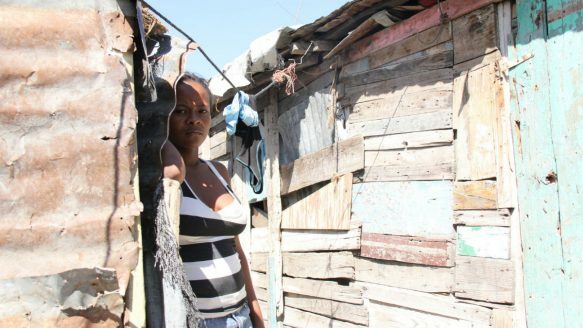 A survey of 44 former camp dwellers by the Institute for Justice and Democracy in Haiti revealed the same thing: only half managed to stay in the same house when the rent subsidy ran out, and of those, most said they still hadn’t paid their rent. The challenges the country faces remain daunting. Many of them could be fixed with money. The government runs on an anemic budget of $3.2 billion — three times less than Toronto’s operating budget but serving more than three times the number of citizens. About half of that money came from international aid, Lamothe said — but not directly. Less than ten per cent went into budget support, according to a 2013 UN report. And today, the government has no more control over it, Lamothe added. That has to change. After four years, it’s time for the government of Haiti to be given control of its own rebuilding. As for the non-governmental organizations that have flooded this country, they are dwindling, according to the UN’s humanitarian report. Despite their smaller numbers, they are not co-ordinating better. His government plan acknowledges a need for 400,000 new housing units to be built by 2020. But, with the money available, they’ve only managed to build 5,000 units so far. And though the government’s slum rehabilitation project, called 16/6, is coming soon to Fort National, its unlikely Rene will receive a new house. The plan’s model is to rejuvenate the area with new walkways and solar lamps, maybe a community centre, if that’s what locals say they want. They will also rebuild a modest number of houses, but those are for homeowners, not renters.